The articles about Robin Rishworth and Bob Simpson appeared in the Oct-Nov. 1997 edition of the now defunct magazine Australian Cyclist. The articles are reproduced with the permission of Bicycle NSW. Here is ©opyright information. Two cyclists wanted to be the first to cycle the complete length of the Canning Stock Route (CSR). They came close to finishing in the same week in 1997 (Robin's start/end dates are in yellow on the 1997 calendar shown). Read about each cyclist's traverse - the first Robin Rishworth and the second Bob Simpson. Each has a claim to the title - it's just that each has a different idea as to what the title is. Robin simply wanted to be the first to travel the length of the CSR with the minimum of outside support, which he achieved by beating Bob by arriving 8 days earlier, but taking 11 days longer for a slightly shorter distance. Bob (who started after Robin and probably realised he may not overtake Robin) then wanted to visit each well so he could claim he travelled the full length of Canning's stock route, and not just between Halls Creek and Wiluna. Interestingly, Bob Simpson became the fastest CSR cyclist even up until (at least) 2017, where the second fastest traverse is by Russell Worthington (23 days in 2009). The first thing to note is each cyclists' statements about start and end times. Robin says he started cycling on the day after he arrived at Halls Creek - Wednesday 18th June 1997. Another document I have says he arrived at Wiluna after 26 days, 23 hours and 45 minutes - which gives his start time from Halls Creek PO as 9:00AM, and his arrival date at Wiluna as 8:45AM Monday 14 July - 15 minutes short of a full 27 days. Bob Simpson states he had 16 full days of cycling after starting from Halls Creek at 10.20 AM on July 7 (a Monday). He finished just before sunset on day 16 which makes his finish date Tuesday 22 July around 5:25PM - but he says the Wiluna police told him Robin had finished just 4 days earlier whereas Robin's stated finish date puts his finish date 8 days earlier. The discrepancy may be as simple as Robin not informing the police that he had completed his traverse until 3 or 4 days after he actually finished (I have information that he suffered food poisoning after eating at the Wiluna Pub, which may have delayed his exit from Wiluna and his informing the Police of his movements). On 08th July, while resting briefly at Durba Spring, Robin says he hears rumours of another cyclist on the track - Bob had left from Halls Creek the previous day. This would indicate that either someone who knew when Bob was leaving Halls Creek was at Durba Spring (the couple from Esperance? ), or that someone had a sat-phone or a even a UHF radio for outside communication (or perhaps some news was heard on an AM radio?). It's surprising that Robin would react so quickly, knowing that he was over half way (only 16 Wells to go) - but perhaps he just didn't hear the full story that Bob had started out the previous day. It's clear that Bob and Robin had very different ideas about cycling the CSR. Bob saw it as a challenge to complete the whole route - including visiting each well - but doing it in the shortest possible time. He had friends with vehicles and they had time to spare to help him. And having the latest bicycle technology was an absolute priority - he knew that travelling in soft sand was difficult. Bob had the equipment, the support, and was cycling as fast as he could on an unladen bicycle. Robin was from a different school entirely - he was doing it largely on his own and his aim was to be the first person to complete a traverse of the CSR - he wasn't interested in visiting each well if that would prevent him from being "the first" cyclist. He had a "friend" to help in leaving out the food drops for him. However I suspect that Robin would have preferred to have done the food drops himself and thus be totally self reliant. In the end though, he's forced to ask people he comes across for help in patching and inflating his tyres. Robin had very basic equipment, carried a large weight in food and water, was forced to push his bicycle along many very sandy sections, and suffered equipment failures. 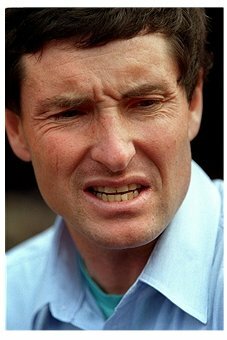 Robin Augustus Rishworth (born 1965) was something of an athlete even before he was the first to cycle the CSR at age 33. He grew up in Melbourne's East and received a conservative Catholic school education. He began competing in fun runs from the age of 13 and progressed to national then international events. He was winner of the 1989 New York "Empire State Building Run Up" race (with a time of 11:08). 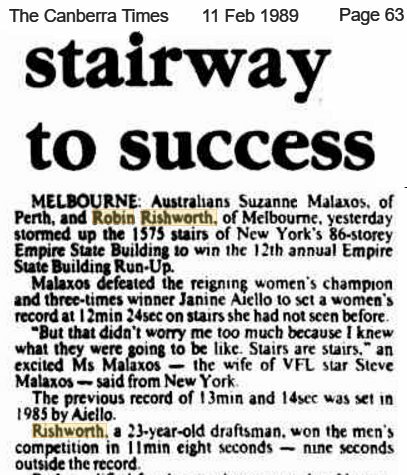 He has twice won the race up Melbourne's Rialto tower (1989, 1990) He came second the next year. 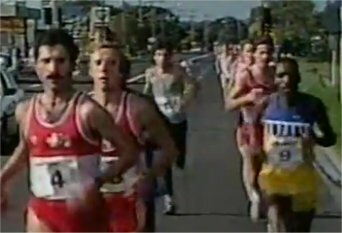 In 1986 he did a lot of running including winning the Alice Springs Marathon (Sat. 9 Aug.) with a time of 2:38:52. Two months later he competed in the Melbourne Marathon (Sun. 12 Oct. - he's the third runner from the left with the grey top and black long pants - the race winner is on the left). Robin was in the lead bunch for much of the race, but eventually came home 21st with a time of 2:29:20. As a cross country runner and skier he also excelled, winning the Bogong to Hotham (Rooftop Run) on 27 December 1986 (at 21 years old) with a time of 8:16:46. He came second the previous year with a faster time of 7:46:08. Robin is a map-maker by training, and worked as a government surveyor for more than 10 years, and later started his own mapping business. Robin would travel about 60,000 kilometres a year for work and sport, eventually mapping 40 per cent of Victoria. Robin, now in his fifties, lives in Buxton, at the edge of the Victorian High Country. Robert Simpson first came to Australia in 1992 with his wife Jayne. Bob cycled the Simpson Desert Cycle Classic in 1997 and came second (5 hours behind the winner!). comments Copyright © 2016 Peter Gargano. Amendments? - email me: bike.csr@gmail.com.